A few months ago, I approached Nikki with the thought of interviewing her for Notes From the Edge. At the time, all I knew about her was that she was Chris Squire's ex-wife, and that she had her own group, called Esquire (whose first album I had bought new). I thought that she would have an interesting story, given her inside view of Yes. She was reluctant at first, but soon warmed to the idea of talking about her life. Over several weeks, countless emails and a wonderful two hour trans-Atlantic phone conversation, what has emerged is a portrait of a very complex and passionate woman, mother and musician. 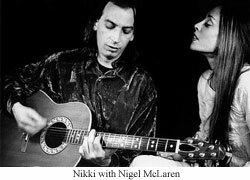 What follows are Nikki's first public comments about her life with bassist Chris Squire, and her own musical career with Esquire and beyond. I hope you will enjoy it as much as I have. PAUL SECORD: Where did you grow up? NIKKI SQUIRE: I was born in a country village in England. I was still very young when my parents and I moved to London, in fact, the East End of London, where they built their businesses. PS: What did your parents do? NS: They were market traders for many years and they ran their stalls in all of the famous markets. Places like Petticoat Lane, Roman Road Market, Brick Lane--too many to name here--but, the interesting thing was, a lot of these places were enveloped in Victorian architecture and full of character, just like the people who were the traders. So I grew up a cockney girl with a very grounded life, with a spirited collection of people around me and totally in love with my mother, who has always been a powerful force in my life; a good woman. 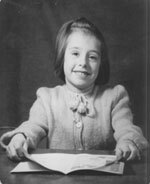 When I was eleven years old my sister Lois was born and we were a strong family unit, and indeed, still are. PS: What was your childhood like? NS: My early experiences were that of watching the not so financially secure people striving to and becoming successful, both lawfully and unlawfully! A bit "Oliver Twist" a few years on! My sister Lola and I could play outside, it was safe and secure and we grew up with our wits about us, and thinking on our feet. PS: Did you live in a musical home? NS: My parents listened to a varied catalogue of music and the radio was on every evening-they were not big television viewers. There were always things to do and I used to help my mum make things for the markets. PS: How did you get interested in music? NS: I always loved music, especially singing, so my friends and I would regularly put on shows in one of the houses in the street and all the children would come and I would be the singer. However, when I became a teenager, I knew that the East-end wasn't where I wanted to be forever. I was ambitious and so I went to business school in the evenings, Corona School of Drama in the day, worked a Saturday job, eventually working in the west-end. I started my own business and took piano lessons, always listening to music, some of that being: ska (Prince Buster), reggae, Woody Guthrie, Bob Dylan, Joan Baez, Joni Mitchell, Judy Collins, James Brown, Jimi Hendrix, Thelonious Monk, Charlie Mingus, Stevie Winwood, The Beatles, Crosby, Stills and Nash, Neil Young, Stravinsky, Holst, Bob Marley. All of these artists are as they come to mind not in order of time or preference and of course there are still others like Cream, Iron Butterfly, the Eagles, Led Zep (Kashmir being one of my favorites)--I'll stop here! As well as music that has influenced me in the past, and still does, I listen to new music from a variety of artists; music is always playing in my house. PS: How and where did you first meet Chris? NS: Chris and I met in the then famous 'Speakeasy Club'. I think the best music club of that period, not a jazz club, but a place where Derek and the Dominoes (Eric Clapton) Jimi Hendrix, Keith Moon, and others from the list I have already mentioned played. Everyone in the business frequented the place, it was excellent and on the evening of the 12th of August 1970, we began what was at first a friendship and the rest, as they say, is history! PS: What was your life with Chris like? NS: It may be difficult here to compress fifteen years into a few paragraphs, but here goes. In the very beginning Chris and Yes had not yet finished recording THE YES ALBUM there were only the two previous albums TIME AND A WORD and YES, so full-on success and international success was yet to come. Therefore as a couple and with Carmen, a family, there were so many different dynamics to our lives, we were both around twenty-three and things were exciting. We lived in north London, then later in Notting Hill Gate in London. Chris was touring in America and Yes were becoming more and more successful. In those days we both disliked being separated but, as they say, it goes with the turf. Having said that, Carmen and I did go on tour quite a lot, Carmen would always sit on Chris' bass speaker with her little legs swinging in time with the band. In December, 1972 we bought a house in Virginia Water in Surrey, known as "New Pipers". Chandrika, our second daughter, was born a few months later, in February 1973. We set about renovating, and redesigning the home. We also built the recording studio under the house. RELAYER was recorded there, along with FISH OUT OF WATER; the ESQUIRE album and many other projects--but both Chris, myself and the girls lived with builders for years! We tried, and succeeded in many ways, to have a normal family life, along with the builders, the recordings, rehearsals, touring, business meetings, school functions and family get-togethers--it was varied and never dull. I would like to take the opportunity to mention some of the key people that worked for Chris and myself and family. They helped us make it all run efficiently: Nigel Luby, Jimmy Halley, Peter No. 1, Margaret Carr, all of whom stayed with us for years. Last but not least is Richard Davis. Richard looked after me, would drive me to meetings, help me take care of business matters and ran the studio with me. He was there at the first recordings of mine (when I teamed up with the band from the Embassy) and was always very kind and tolerant when the three girls of ours were being demanding and driving him mad! Most of all he was my true friend and confidante--and still is. Thanks to all of you--we did have some fun! Christmas was always a big family event. We would decorate the central dining hall with a large candlelit garland hanging from one of the beams. 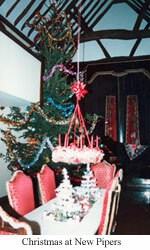 The Christmas tree was always at least 25 feet high and exquisitely decorated by Chris and the girls (the vaulted ceiling was over 30 feet high). A really traditional feast and in those days our only non-vegetarian meal and Chris, as in millions of other homes, would be Father Christmas. It was elegant, fun and they were just the best times. We were all vegetarians and lived on organic food (since about 1970) so food preparation was quite a big thing. In the grounds of the house we had a kitchen garden, so we had homegrown produce too. Chris and I took an active interest in matters of ecology and health and cultivated the land surrounding the house using organic methods. I studied health and diet extensively (I am involved in this still). It was incredibly busy sometimes and took a tremendous amount of organizing. Then in the summer of 1977 Camille was born--the youngest of the girls. We lived at home, toured together (whenever possible), lived in other countries together took holidays, we were, in every sense of the word, a family- and we loved each other. PS: Can you describe what brought you to begin practicing vegetarianism? How strict of a vegetarian are you? NS: In the late sixties there was a greater food awareness occurring, questions were arising as to the processing and preserving methods, and the amount of chemicals being used. Organic methods were coming once again to the forefront. I was greatly influenced by this and saw it as good sense and decided to live that way. As a side effect I studied both nutrition and physiology. Then understanding more about food and health it didn't take long before becoming vegetarian. The issue of how animals are treated, the farming methods used and how much is land taken up for this purpose all contributed to this decision. When Chris and I were together we were strict vegetarians and the girls were raised in this way. It takes a lot of food preparation and cooking recipes to ensure that you have a balanced intake of proteins using pulses, tofu etc., and high quality fruits and vegetables. For a family it helps if you have assistance in the kitchen! I have no doubt that it is the best way. An added problem now is whether we can trust the government decisions on animal health and feeding, I receive newsletters on all these problems and I read some horrendous stuff. I see many people in England are vegetarian simply to avoid BSE. I still use all natural foods and beauty products, only these days fish is on the menu, along with rice fruits and vegetables. I have practiced Pilates for six years and now practice ashtanga yoga too. PS: You mentioned your second daughter, Chandrika. That is a very interesting name; is there a story behind it? NS: When Chris was young, he had a very good friend called Darian. Darian's father was Indian and his mother English. They lived in Hampstead in London and were an extremely interesting family. Chris spent a lot of time at the family home and there was a bond between him and them. Chris and I had visited together, very artistic people I remember. They also had a daughter in this wonderful family called Chandrika, this name was passed on to our daughter. An Indian name by origin, Chandra (pronounced chundra) means Moon. So Chandrika means "Little Moon". Unfortunately Darian is no longer alive--Chris told me recently that his new son's Christian names are Cameron Darian. PS: What kind of influence did you have on Chris' writing with Yes and his solo work? NS: In between all that I have already spoken of above, there would be many times where I would sing with Chris at the grand piano or Chris would sing something to me and I would give an opinion or an idea. The same with the guitar or the bass and downstairs in the studio it would be the same too, or I would watch him working and learn. Chris has a brilliant sense of harmony and is a fine musician, singer and bass player, so being there and taking it in has certainly influenced me! He would always carry stacks of 'out-take' cassettes from the studio and practice vocal harmonies to and from London, which was an hour long journey at least, I would be there and sing them with him, or make a suggestion perhaps, or simply be there. What influence I have had specifically on Chris is not for me to say, but we certainly shared a lot of musical and family life together. Creating music, by it's very nature, is a tapestry of people, times, moments, influences and inspiration, taken in by all we see around us--therefore how could we not have influenced each other. PS: Did you and Chris ever write together? NS: Yes; it's very difficult to say all the small bits here and there that we may have contributed to each others songs, a few words, a line, or even one word, but all of the elements I have just mentioned have happened. For the most part, this question is answered above, but one song that does come to mind is "Red Light Ahead". We sang that song together so many times--I have always loved it. Some of the same lyrics feature on the closing vocal that Chris sings on 'What You've Been Saying', one of the tracks on the Esquire Album. Although I write all my own lyrics, it wouldn't be unusual for Chris to make an appearance like that, with his lyrics and vice-versa, This being an example of one of the subtle crossovers that inevitably would occur in our life as it was. I would like to add that I have listened to "Red Light Ahead" on the new CONSPIRACY album. I think Chris and Billy have made it really shine, It's captured a strong feeling. FISH OUT OF WATER was written and recorded in the studio at our home. I sang vocals on "Hold Out your Hand", one of the tracks from that album, I was there throughout, I'm sure I helped, at least, that was my credit on the album! Much later on, "Run with the Fox", I sang on that track, I think I might have helped a bit too. PS: What are your kids up to these days? NS: Carmen is a very successful voice-over artist, I hear her voice everywhere (television and radio)! She is very good on her American accents. 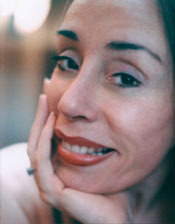 Also Carmen writes, sings and performs, and is currently studying other languages to enhance her career. Chandrika's love, primarily, is being a DJ (American House & Garage) at which she is excellent. She has toured both England and Europe in the last couple of years and also now has a senior position in a company that manages high profile record producers. Chandrika has always worked in the music industry since she left school. Camille works in the business of computers, although she still likes to stay with me (I no longer live in England) and we travel together. She knows a lot about the music industry and likes it--so we'll see, she has time to decide. PS: How did Esquire come to be? What was your role in the band? NS: I was definitely soul-searching, I wanted to write and sing my own songs, but I didn't, at the time, know how that could happen. I needed other players to work with--all the people I knew were already more than established and had heavy work schedules. I wouldn't even have approached them. Things were becoming delicate in my private life too. Then one evening around mid l982, Chris and I visited the then Embassy Club, (another popular music business venue). A band was playing and in that band were two of my cousins. After their set was finished they came over and spoke to Chris and me and I didn't recognize them, as I hadn't seen one of them since he was a small boy and the other was a cousin-in-law. Chris was going to spend some time in New York, the studio at the house was free, so I offered to help them record a couple of tracks. 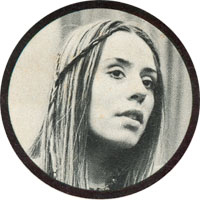 For about three weeks we worked together in the studio, by which time I was singing lead vocal on one or two of their songs, I had a particularly good rapport with their bass player Nigel McLaren and we were working longer and later in the studio writing songs together. Later the band 'New Cross' and I performed at the 'Embassy'--looking back, I suppose it was exactly what I was waiting for. Chris had gone away and come back to find his wife in a band. He really liked the idea and was more than supportive. The band was short lived for various reasons, but Nigel and I continued to write. In March '83 Jill Sinclair & Trevor Horn signed us to ZTT. 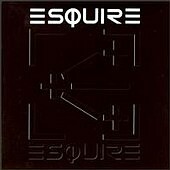 We had written "Hourglass" first and the other songs that are on the Esquire album were developing one by one. We met Charles Olins and we teamed up, continuing to write. The three of us continued to write, but we were waiting for Trevor Horn to produce our album. In between the odd futile rehearsal sessions that Trevor would initiate and the numerous false starts to record the album (because Trevor hadn't finished the last project), then more late projects--we waited and went on waiting! This was a painful experience I can tell you. Then in 1986 (three years later :-) a smile of exasperation! ), John Kalodner of Geffen Records happened to be in Jill and Trevor's studio and I played him "Knock Twice for Heaven" and "Special Greetings" and he wanted to sign us immediately. After the lawyers, we had our release from our contract with ZTT! Esquire formed a band and became a band, at last. The album was recorded in Virginia Water, London, and California for Geffen. PS: When you were working on the first CD, what was the writing process? NS: As I mentioned earlier, Nigel and I were writing together when songs like "Hour Glass" came to be, so. As a for instance, the verses to that song were written purely with my vocal and Nigel playing the bass. I created the melody and the lyrics at the same time. Nigel playing the grand piano inspired the chorus, and the lyrics and melody evolved in the same way. When Charlie joined the band he later elaborated on the piano part in the chorus's to "Hour Glass", it became more prominent and inspired me to elaborate further on the vocals. On "Up Down Turnaround" I wrote the verses on the grand piano (although I don't play well enough to perform, it's O.K. for ideas) and at the same time the melody came and the lyrics. More often that not I would get a good framework of lyrics from the initial inspiration and later work on filling in the gaps. Still with that same song--Nigel and Charles were responsible for the music in the choruses and also elaborating on my piano parts. In the end it becomes collaboration. One last example is "Knock Twice for Heaven". I simply said to Nigel that I wanted to write a song with that title, I didn't know why. He was very happy about this and we set to it, creating the parts, the lyrics and vocals. Nigel did a lot of the arrangement on that track too. He was the one with all the good ideas that day! The rest of the songs on the album developed in a similar way, there are still some, as yet unreleased tracks written by Nigel and I very shortly after the Esquire album was finished. PS: What role did Chris play in the early days of Esquire. NS: Chris was always very supportive and would listen with interest to the developing demos. He was not staying at the house very much, sometimes living and recording in London and sometimes in the U.S., although I would often play him the tracks down the telephone line--to get his opinion on the tricky bits! If Chris was at a particular Esquire recording session, he would give his undivided attention as any dedicated musician would. Sometimes coaching me whilst singing- and he was tough, I had to do it perfectly and reach the high notes spot on. I always enjoyed working when Chris was around. I think Chris's influence was with me, whether he was there or not, always thinking if he would approve of my approach to a vocal, a lyric, a harmony etc., embracing a standard that I had not only admired in Chris but in Yes as a band and it's members. Chris and I worked closely on "To the Rescue" with Nigel and Charlie in a studio in California, called Record One. Although the song had already been written and was in demo form, Chris embellished the song tremendously as well as singing harmonies, some of those prominently in the middle eight. Then, of course, Chris and Esquire were together for all the mixing of the album at Ocean Way studio in California too. There were long times apart and long times together whilst the Esquire album was being written and recorded, but, as I have said, Chris's musical influence was there throughout for me personally, I think it always will be. PS: Why was there such a large time lapse between the first and second Esquire projects? NS: Change is inevitable in everyone's life, but during the latter part of the making of the Esquire album, mine was changing drastically. By this time Chris and I were divorced after fifteen years of marriage and had a somewhat sketchy relationship. Finally our daughters and I were alone: our home, our lives, nothing was the same. Charles Olins had disappeared (so to speak) from the band, Nigel McLaren and myself were also alone. So in a scruffy smelly basement Nigel and I put together a small studio and set about writing "Coming Home". Trevor Horn always said I hadn't suffered enough for my music (because of my connections with the business). Well I was now! I can only say that (with a smile on my face) that some of it was nothing less than a nightmare. I also understood what disappointment meant and how no one was exempt--maybe I was learning something. So I wrote the title track: its about coming back to the home of one's heart to gather strength and understanding and feeling--the general lack of it--in the world. Later, as the album evolved and the joss sticks burned in that basement, Nigel and I got more help and other players contributed. Carmen sang on the tracks again, a better studio and so forth. Finally after a long, long time the album was released. The above answer forms part of the, as yet, unfinished biography on my website, but basically gives the answer to this time lapse. There are many variables to this question in the more general living, emotional and family sense, outside of the musical world--which also stretches the time long zone. 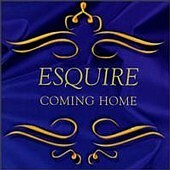 PS: Are there any new Esquire projects planned? What else are you working on? NS: I am currently writing new songs, working with new musicians, I think it will be an Esquire project, but it will be with a new line-up--life is very exciting once again. There are unreleased tracks post the ESQUIRE album, also unreleased material written since "Coming Home"--some of the songs feature Robbie Blunt, a guitarist from Robert Plant's Band. Two Esquire tracks are currently featured on the YES' FRIENDS AND RELATIVES album. I have been invited to be featured on an important album. When it's confirmed I will tell you who it is. There is also some talk of a DVD--news to come.